Simply put, Temptu is the world’s most popular silicone based airbrush makeup brand. While I have visited their showrooms several times in the past, I have never had a chance to interview the forces behind this amazing company, who seem keen on maintaining a lower profile than most, perhaps in deference to their vision of Temptu as a team based business. 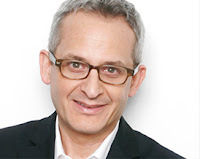 Michael Benjamin is Temptu’s CEO, and has been with the company practically from its inception. This very affable, fast talking gentleman is possessed by an infectious enthusiasm for his company, almost as if he wasn’t aware of the legendary status it has gained among the niche of makeup artists who have fallen in love with the brand. I was lucky enough to spend some time with Michael at Cosmoprof 2019, in my own city of Bologna, Italy. I had been waiting for Temptu to take part to this show for years, and almost couldn’t believe when I finally saw their booth on the floor of the massive trade fair. I am especially proud to welcome Michael to our Airbrush Makeup Hall of Fame, where this medium is celebrated for its own culture, and where I like to introduce the creators and the artists that move this culture forward. 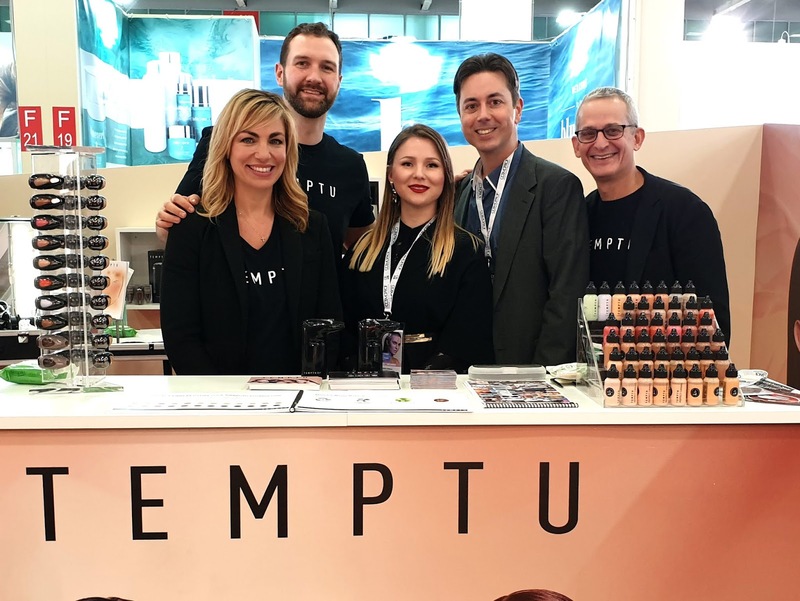 How did the Temptu brand get started, and who created it? Sam Zuckerman was the creator of the brand, which has been around since 1980. He did camouflage for the Army in WW2 and he was in cosmetics forever, working for Revlon and all the big companies. He was the very gifted chemist who put the stripes in stripe toothpaste, and for Saint Patrick ’s Day he made the Chicago river green. He was always an independent, then a couple of movie artists approached him for a movie called Tattoo (now a hard to find cult favorite) and that’s how Temptu was born. For the first ten years Temptu was doing temporary tattoos [hence the name of the company], and they were doing it for the movies. At first we would literally screen right onto the body, then we found a way to get the designs onto newsprint, and finally we found a better print paper that was not newsprint paper but a cosmetic paper. We had an amazing process of making temporary tattoos that nobody had, and it became a big Hollywood hit as well as in fairs and theme parks. That’s when we started a business. What about your own background? How did you start in this business? I was in the restaurant business, and one time I had to figure out a way to put tattoos on my waiter-actors for a 1950’s themed diner. There were basically no temporary tattoos on the market except for these first Temptu products. I found them as they were being used in another restaurant in the Theater District called Trixie’s, and through them I got to meet Roy Zuckerman (Sam’s son) at Temptu. I was young and I did not want to be in the restaurant business forever. Roy gave me a summer job at the same time the movie Cape Fear was being filmed, and all of a sudden I am new to New York and I’m alone in a room with Robert De Niro and a makeup artist. I loved this new, weird and eclectic business and that is what got me in. Within a few years we started airbrushing tattoos. 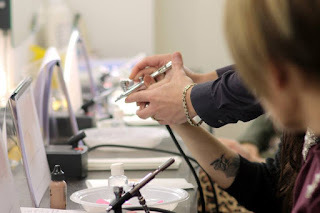 Temptu partnered with leading airbrush maker Iwata. We were the first to do airbrush tattoos and that’s how we started learning the airbrush technology. How did beauty makeup come into play then? I took a break from the business in ‘94 to ‘96. I went to Russia and I was back in the restaurant business and when I came back we looked at where we were… We had a business that was very busy in the summer and very slow at other times. We knew that airbrushing had started spreading in the beauty makeup sector with Dinair. God Bless Dina [Ousley], she is the godmother of airbrushing and we give her a lot of credit for starting it. This was before the internet, and a bit later we came out with our own formula that was water based and we launched it at the first ever IMATS as Temptu Pro. It was not just airbrush at the time, it was also special effects products. We produced alcohol based palettes and started competing on that level as well. We were a NY based company and it was hard to break into the Hollywood scene at that time. We were mainly doing NY productions and people in the West Coast were mainly doing West Coast productions, and we thought it was easier that way as we were not stepping on anyone’s toes. That’s what really launched Temptu in ’97. Yes, it was our original Aqua formula. A makeup artist named Syliva Pichler said we need to make this formula better so she and our chemist Roy started working on it and it was on the bench for two years. If Dina is the godmother of airbrushing, Sylvia is the Godmother of Temptu, so to speak. She is still working with us and I will always have her on my staff as long as she wants to be. She is our master educator and she does great classes in our NY showroom she also helps us on R&D and we love her opinion and people see her as a visionary. Was it her idea to start with silicone based line? I’m not sure where it came from. I think it came from Hollywood, but at the end of the day I do not really like focussing on one ingredient so much. Water is an important part of our formula too. I see a lot of water based companies that have silicone and in the end it’s about emulsions and blending ingredients. We have more water than most in some of our formulas. For me it’s more about pro performance, and that is the inspiration rather than the ingredients. That is was Sylvia and Roy ultimately achieved for the company, and that’s when we became famous. When SB came out in 2002 we became known for creating a superior product. Yes it put Temptu on the map of airbrush makeup and ultimately beauty makeup became our main focus, while special effects and tattoos remained in the line. Yes she is my wife and business partner and her brother Greg is my business partner as well. She is the boss lady; she raised my kids and runs the business with me. She is book smart and she keeps things tight and organized and so does Greg who is our CFO and COO. We consider Sam our chief marketing officer, and they call me CEO but I am like that wacky guy… I am like Roy Zuckerman who comes up with a 100 ideas. But in truth we all collaborate well together. And not just Sam and Greg and myself, but all the employees as well, as we see them all as partners in this business. Sam is the one who holds everything together; she is the heart and soul of Temptu. Is there a turning point or main event the defined the shape of the business? The movie Stepford Wives. I think SB was never better used in the early days than in that movie. 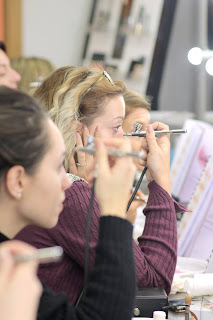 We create makeup that can be used by hand or air and people use it in both ways. In Stepford Wives we used it by hand on the body and by airbrush on the faces, and if you look back at the movie the women’s skin looked perfect, like porcelain. Cape Fear with Robert De Niro was the defining moment for our tattoo Dura line, and Stepford Wives was the turning point for our S/B line. We were very honoured to be part of both of these movies that put us on the map in the airbrush makeup world. I feel proud that we have given makeup artist the ability to work faster, market themselves more easily and charge more. Temptu has established itself for giving great complexion and that is our foundation. We have always had our in-house chemist going back to Sam Zuckerman. Our makeup is beautiful however you put it on, and airbrush gives you options as to layer it, and have the blush underneath the foundation as well as highlighting. What do you think is keep airbrush makeup from going mainstream? I think it is an educational problem, people being intimidated by the product and not wanting to a learn a new thing, but on the other hand professionals really get it after they see the finished product. I think that if consumers could only see how easy it is… I watch my wife put in on in 15 seconds in the morning and it speeds thing up for her, as she takes 20 minutes for her hair... We are at the Cosmoprof right now and we were just awarded the Cinderella Effect prize, which is indicative of the fact that people want instant results. I don’t think there is a faster way to better complexion than with Temptu, it takes only 15 or 20 seconds for a light to medium coverage and this is what we need to keep pushing out there the in the marketing world. We need to promote the idea that People need not to be afraid to learn something that is quite simple to use, as well the difference that airbrush makeup looks so natural. We are also happy with the Perfect Canvas line. It is the perfect combination of makeup and skincare. I always say the S/B is the mother, and Perfect Canvas the daughter who went to university to get a skincare degree. After using Perfect Canvas people feel their skin is healthier, and we have clinical studies that show that. I think that is the future. We also have a new product that has skin care properties that is called Core 7, and if you use it consistently it has wrinkle reducing properties. Core 7, the number stands for the seven signs of aging. It’s a new product that we will come out with in the fall. We want people to take care of their skin, we want people to use less makeup, based on the idea that I think the less is more when it comes to makeup. A lot of people want to see the makeup they apply, but as Sylvia says, if you can see it you’ve put too much on. We want to promote the idea of healthy people with healthy skin who just add a finishing touch. As a brand we want to hear from the artist, the artist has always inspired us and that is why we are the brand we are today. Silvia is an artist and it is just not her but she was probably inspired by artist as well, but we do what the artist want, we took a ten pound compressor and make it into 8 ounces and made it portable because that is what artists want we want them not to have a heavy bag so we are always inspired by the artist and that is really the vision we have for the company. As a teacher I see how airbrush makeup changes people’s perspective on makeup. When a product is as effective as yours it literally changes peoples working life. Are you aware of the love that surrounds your brand and how does it make you feel? It is humbling to me and ultimately it is a validation of our effort. We are working really hard and we are not a big corporation that you can find in all the stores. We are a little entrepreneurial company that is working hard to be inspired by artists, trying to do what they want and take it to the next level for them. Our job as a brand is to focus on pros while waiting for the consumer to catch on, and the “prosumers” that have caught on, God bless them… when you hear that affirmation from people using it means a lot me. It means we are on the right path. How do you see with the future for Temptu? I feel that with Temptu or every small company, every year is a new year and you hope you do well and you have to keep moving forward, the forces in this world are very competitive, so I am just honoured that we have been in business this long and we keep doing what we’re doing. We are the Little Engine that Can, and we do need to transform ourselves as we move forward. Right now we may be the airbrush beauty authority, but we want to be the complexion authority, and we want to keep working on products to this end. We are open to everything. As ideas come to me, or artists come to me with ideas, I take everyone seriously and I am ready to listen. It was a pleasure and an honor to meet Michael and his team, and I hope to see him again soon in New York. As we part, I take pride in telling him that Temptu need not “want” to be the complexion authority in makeup. To the growing number who use their game changing products, they already are. Very shortly after I started publishing the Italian version of this website, I received a call from an initially shy makeup artist asking me to teach her the technique. I was both flattered and surprised. I had started posting about airbrush makeup out of a simple consideration: the web was lacking a truly independent, comprehensive and in-depth source of information on this aspect of makeup. I decided to fill in the gap and share what I knew and what I was still learning, trying to produce the kind of reference bible that I would have liked to find for myself when I became interested in airbrushing. I mentioned the "Italian version" of the site because Italy is where I live most of the time, but of course if I wanted to have any kind of audience at all I knew I also had to publish in English, which is why you are reading this very page. Back to that first phone call, the girl's name was Angela, she was a Cosmetologist and a makeup artist, and had heard about the technique but couldn't find a course that seemed reliable to her. I told Angela that I would be happy to teach her, but in order to make it worthwhile for me and not too expensive for her, perhaps we should try to put a small group together. Flash forward to a few months later, and my very first class was formed. 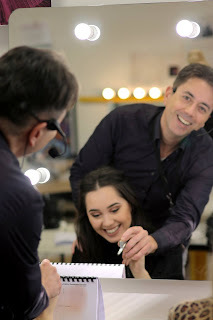 I had prepared a program and a manual, but of course I was almost more scared than excited at the idea of teaching to a bunch of pro makeup artist. After all my own background was more in the performance field than strictly in makeup. Yet I couldn't -still can't- contain my enthusiasm for airbrushing, since it had completely changed the way I used to do makeup and it had done so for the infinitely better. I decided from the start that I wanted to teach this discipline in all of its aspects and with as many brands and formulations as possible, in order to give a truly objective idea of its potential. Each students would learn basic application techniques first, then experiment on themselves and on each other with the different brands. While signing with a single manufacturer would surely have been easier and possibly much more financially rewarding, I always thought that it would be tantamount to trying to teach traditional makeup with one single brand as if it was the only one available and the best one in every aspect. We know this would be absurd for traditional, so why should we apply it to airbrushing? The final results of an airbrush application vary distinctively depending on the formula (water based, silicone, hybrid or alcohol), and on the brand that is being used. I am not discounting the importance of single-brand training of course.That remains the best way to get to know a certain line in depth, and there's nothing as exciting as learning directly from the creators of the product. However, since those weren't available anyway in my country, I decided to offer a multi-brand approach as this was the best way to promote the idea that airbrushing is not a novelty or a gimmick, but a whole new and very effective way of approaching makeup, and that it can be easily integrated with traditional techniques but also replace them altogether if one is so inclined. I always say at the beginning of the class that I am going to treat the group as if they had decided to throw away their brushes, and that in order to show the medium's full potential we will be doing absolutely everything (except inner waterline) with their airbrush. They always look to me as if I was crazy, but they inevitably leave with a new perspective. This is inevitably what had happened since that first group. Their response was both enthusiastic and excited, and word was quick to spread. Five years later I am not only teaching classes that I organize directly, but many of the best beauty academies in my country have taken an interest in what I do and have started hiring me to teach courses for their own students, whose feed back is invariably and overwhelmingly positive. Teaching has become a substantial part of my calendar, and it has given me the perfect excuse to continue obsessing with any new product being launched by the various brands. After all, if I am to be the "Airbrush Makeup Guru" I have to be up to date, right? At least this is what I tell myself any time I am about to spend a small fortune in makeup. The fact is, teaching me has made me immensely better as a makeup artist. The process of having to explain somebody else, and that of exchanging opinions and information with my own students, has allowed me to learn almost as much as I have taught. And so now you know the reason why there are hiatuses and sometimes long periods of time pass between posts. I am not editing a new video or reviewing a new product, I am probably teaching courses around this country and hopefully more soon, since languages are not an issue for me. And Angela? Well, not only did she become an airbrushing enthusiast, but also a very dear friend, who is now helping me in most of my videos. Whenever you see female hands in the footage, they are hers.